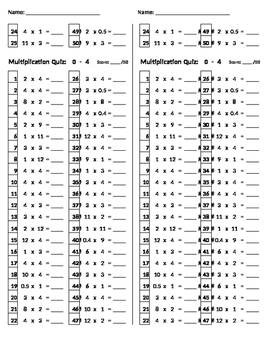 You never look for multiplication tests again after you have this Multiplication Quiz Generator. This Excel file is pre-configured to generate separate multiplication quizzes for each of the fact families from 2 to 12. Each quiz contains 50 problems. These can be used as a quiz, test, homework, math center, or guided review. To generate a new set of quizzes, simply double click into any cell and hit the "enter" key. I use these weekly in fifth grade, giving students three minutes to complete each test. When a student has shown proficiency, he is given the next test next week. 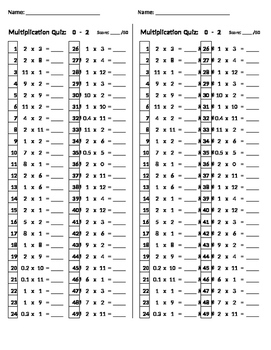 My favorite part about these sheets is that they have been generated using a carefully designed weighting function so that students see a few more difficult problems than easy ones, unlike some sheets that have an equal distribution of multiplicands, which overemphasizes facts of zeros and ones. If you would like, I can make a cute cover sheet full of colored ink that you can show off to your friends. If you like this, please check out my "Multiplication Blast Off" computer game and the other tools at my store, Educational Emporium for Elementary Engagement. 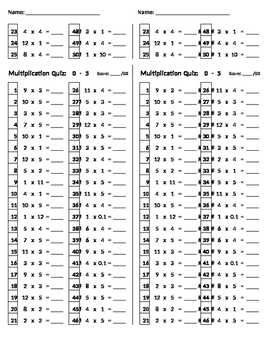 Multiplication Quizzes 0-12: Times-Tables Tests Bundle - Version 'B'. 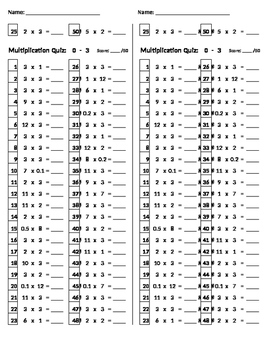 You may also like this Multiplication Worksheet Generator for generating one-, two-, and/or three-digit multiplication problems. Your feedback helps me improve my products and also earns you TpT credit. If you can, please leave feedback, so I know how I'm doing and can upload more of what you want.